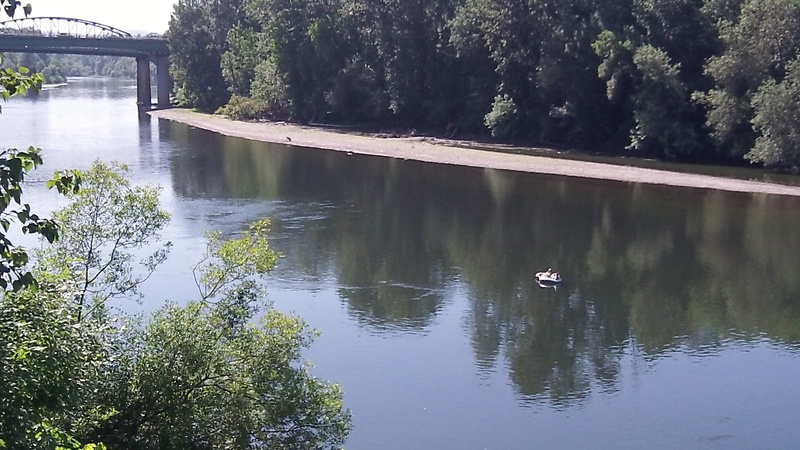 There’s no good way to illustrate a sewer-rate story, so how about a view of the Willamette River? It’s running low this spring, but not so low that people can’t drift down the river in rafts. Albany city utility fees are going up this summer, and the prospect is for additional increases later on that might move Albany up the ladder in utility price comparisons among Oregon cities. Now it’s in 10th place. The city council has already approved a 2 percent water rate increase to start July 1. (See correction above.) Now it is preparing for a public hearing on June 24 to raise sewer charges up to 9 percent. The public works department had recommended a 6 percent hike, but a long-term financial projection called for 9. Which it will be the council will decide. With a 6 percent sewer hike, Albany households using 800 cubic feet of water would pay a combined city utility bill of about $106 a month, ranking 10th from the top on a list of Oregon cities compiled by Public Works. Charges include street and storm water fees in some towns, but Albany has neither. Portland is tops with $162 a month, followed by Lebanon with $132. Corvallis charges much less, about $76. Councilor Floyd Collins said that’s partly because Corvallis years ago paid for system improvements by selling city-owned timber. And yet, according to Social Security, the cost of living has increased 1.7% for the last 2-3 years. And I have documented that my property taxes have gone up an average of 3.05% per year for the past 15 years. Yet, when the state has to pay PERS retirees a 2% COLA per year, it is stated to be a financial catastrophe. So I am forced to pay 3% more each year without it being viewed as a burden, whey they claim that to pay 2% more each year, they’ll have to reduce services, cut class sizes, etc. Yep, the same in California. I brought my water bill to California (Dublin, CA) a month or so back and compared it with a friend who was complaining about water prices in their drought. It was interesting to find out that there are different tiers, with the highest tier (the higher water usage) is priced at more than the first tier. This is to be expected, as folks who conserve will pay less per unit, and those who waste will pay more for the higher units.. But here is where it got interesting. The cost of our Albany ore FIRST unit was as high as their HIGHEST/LAST unit. We are paying far more in Albany Oregon than my friend in the the drought plagued California. Well, he did stop complaining after that. And to tell the truth, I’m not terribly upset about our bills, I do want to pay off the new water works. But I wish the city would acknowledge that this is a bit of a patriotic burden and give us a break in other areas. IF they aren’t using water during Nov-Feb, the city uses “other” means to calculate their sewage usage. Likely, if they are irrigating, all their usage is considered to be “down the drain”. It might be to their benefit to contact the water dept.?? Possibly an adjustment could be made. In former times the residential monthly sewer charges were based on the typical water water usage in February. Now it’s based on water usage in the billing month. So now even when I water my lawn–which does not burden the sewer tmt plant—I get sewer billings based on water consumption alone. I’m being billed for services I don’t use. Council needs to think that thru again. Sewer rates are based on average usage of November to February bills. In reality, since they read the meter “early” in the month, it’s more Oct-Jan. I live in Albany and have business in Lebanon. I’m selling the business and the house and looking at homes in Corvallis. At least they seem well versed on tax dollar expenditures. You might want to calculate your total cost of living in Corvallis. I’m betting it costs less to live in Albany than Corvallis.